Attached to or integrated into a house, sunrooms are impressive additions where to relax or entertain protected from the weather almost all year round. Actually, if you have some unused space, such as an attic or a porch, transforming it into a sunroom is a relatively affordable way to add some extra living space. As large windows, glass roofs, and skylights are common for sunrooms, they are a place where the indoor-outdoor lines blur and usually make a seamless transition between inside and out. In this regard, if you have a view, arrange the furnishings as to not interrupt the scene and keep distracting décor elements to a minimum. Also referred to as conservatories, green rooms, garden rooms, and sun parlors, sunrooms benefit from natural light and warmth and are a favorite place for growing indoor plants. Generally, sunrooms make a stunning extension of any room in any home. Furthermore, whether newly built or transformed unused spaces, they are an option to add functionality, visual interest, personality, and appeal to any house. Also, adding extra living space unquestionably increases the value of the property. In terms of designs and materials, sunrooms come in a variety of options. If already existing and integrated into a house, a sunroom usually is in its architectural style. If it is an extension of the house, whether house-like shaped or a faceted sunroom, wood-framed sunrooms have a more traditional look, while a steel-framed one lends the extension a modern look. For a truly unique look, you can incorporate a glass sunroom into an old house. Note that apart from adding touches of modernity, this approach can also create a sense of dynamics. Furthermore, it is a more affordable alternative to any kind of extension. As for building materials, a brick sunroom is a choice for a rustic look, while, as a rule, wood structures exude warmth and coziness. Sunrooms with floor-to-ceiling glass panels are a way to highlight the surrounding views. French doors that open to a patio or a deck are common for sunrooms. 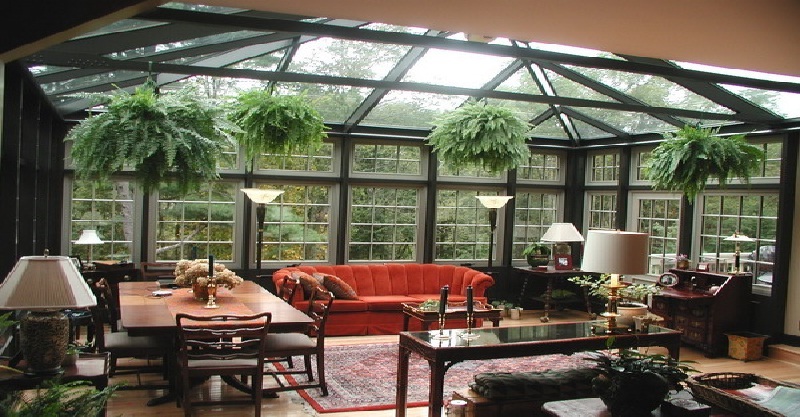 In the picture above, a fascinating sunroom in earthy tones. French doors and large windows let the sunshine in, while Roman shades provide privacy and light control. Elegant furniture offers plenty of comfortable seating. Throw pillows, a throw, and an area rug bring color, pattern, and texture. A stunning chandelier and candles add to the charm and appeal of the space. Some sunrooms have glass roofs or skylights, which is an option to admire the night sky. Above shown, a sunroom with floor-to-ceiling windows and a high glass ceiling. Comfortable seating, plenty of potted plants, pieces of art…What a fresh and inviting space! Shades and floral-inspired curtains offer privacy, sun control, extra color, and pattern. Definitely a dreamy place to relax! 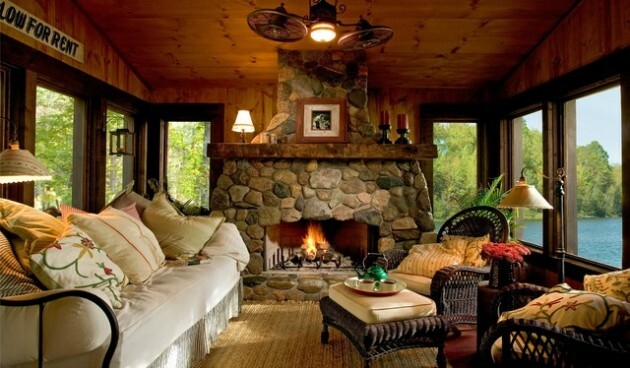 On a side note, for zones with a colder climate, incorporating a fireplace allows using sunrooms all year round. In terms of function, sunrooms can be either an addition to any room or decorated to meet your needs and lifestyle and express your personality. Although sunrooms usually serve as living rooms and dining rooms, they can be turned into bedrooms for some truly hot summer days and even into indoor pool areas. 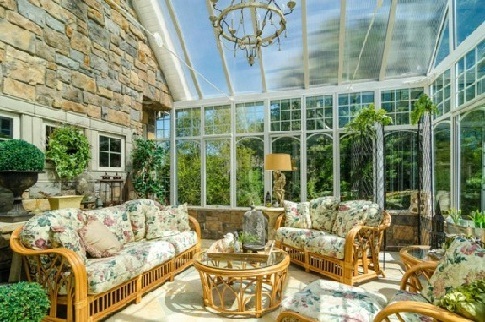 In the picture above, an awesome sunroom. Plenty of natural light, comfy seating, and oversized potted plants help create a dreamy space where to relax or entertain with family and friends. Whether with a formal, laid-back, or whimsical look, of lavish or minimal design, the choice depends entirely on your taste and preference. 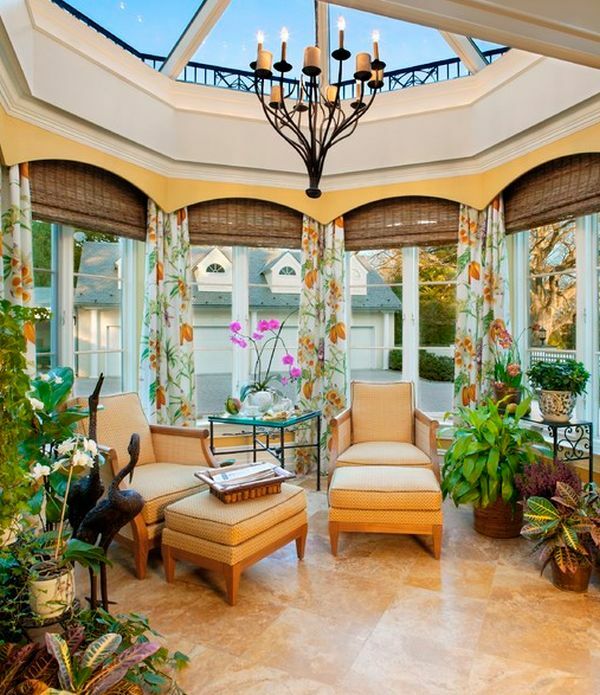 Actually, sunrooms can be decorated in any design style. However, as an extension of the main living space, they usually are in the same style. 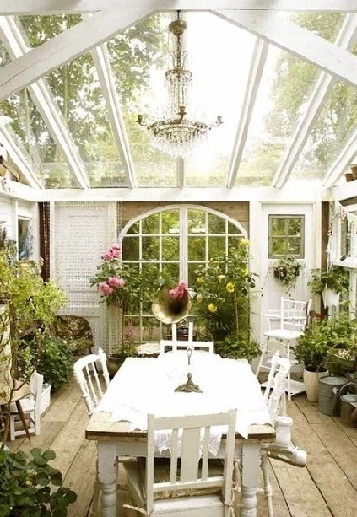 Above, an awesome Shabby Chic all-white sunroom of casual design with a glass ceiling. Plenty of vintage décor items and a crystal chandelier add elegance and personality. A plethora of potted flowers adds color, scent, and freshness. An absolutely charming space! Shown above, a magnificent sunroom of minimal design with a stunning view. An ornate staircase, an astounding glass ceiling, beautiful stained glass windows, a spectacular chandelier, built-in window seating…Multiple throw pillows add color and coziness. Oversized potted plants bring height and freshness. Truly impressive! Unquestionably, sunroom décor should meet your needs and lifestyle. As for the sunroom color scheme, a technique that works well is using neutral colors and easy ways to introduce color, pattern, and texture and tie together the sunroom with the rest of the living space. Throw pillows and accessories are a favorite, common option to do the job. In zones with a colder climate, in late falls and winters, decorative throws add a sense of warmth and coziness. When it comes to furnishings, the latest trend is to use furniture pieces and accessories that make sunrooms look more like an interior space. Flooring options are concrete, brick, wood, or tile. Usually, area rugs are used to both add coziness, texture, and visual interest and help designate spaces within large sunrooms. For extra visual interest and personality, leave uncovered intricate floor designs, if there are any. 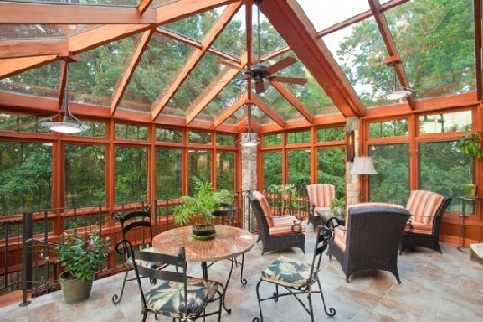 In the picture above, a contemporary wood sunroom with a glass ceiling. This airy space accommodates a comfortable seating arrangement and a dining space. Furniture pieces add texture and pattern. Potted plants bring extra visual interest and color. 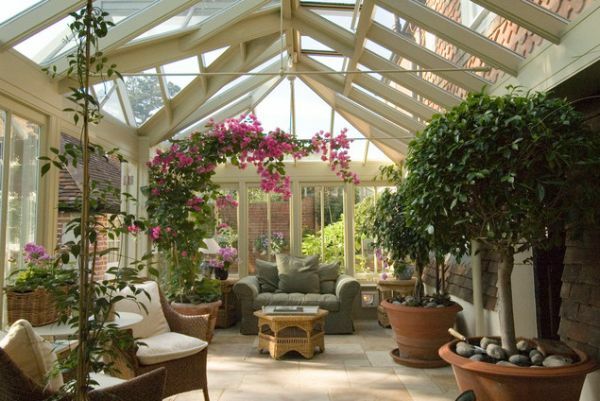 As already mentioned, as they offer an abundance of natural light, conservatories are the perfect space for growing plants. 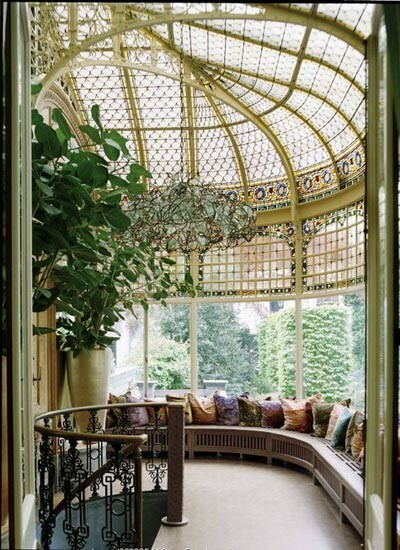 Above shown is a breathtaking conservatory. Flooded with natural light from both the windows and the ceiling, this enchanting space offers comfortable seating and accommodates an array of potted plants. Floral-inspired furniture upholstery and stone wall covering adds some extra organic feel. Lanterns bring charm and romance. However, sometimes sunlight can be disturbing, especially on hot summer days. In this regard, use linen or cotton curtains, sheers, and blinds, which offer light control and help create a homey feel. In addition, they can provide privacy when needed and complement the décor. Note that using bamboo blinds helps add extra organic touches. 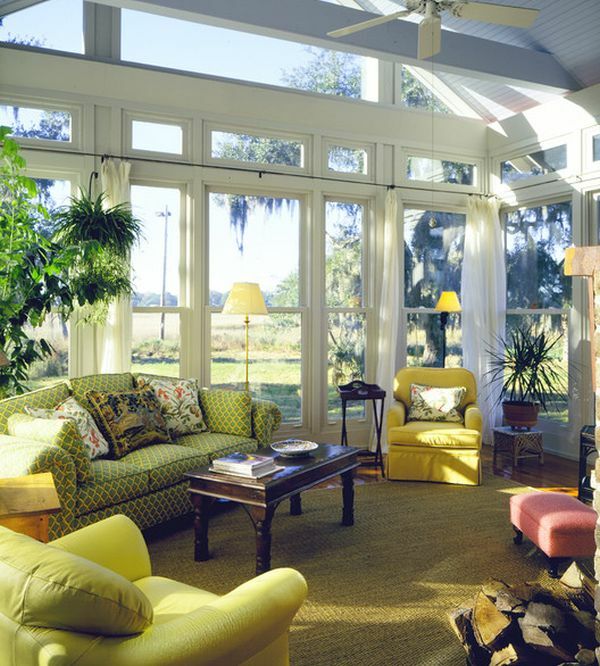 Above, a conservatory in bright, cheerful colors with floor-to-ceiling windows and curtains for light control. A sofa and armchairs offer comfortable seating. Floral-themed throw pillows add coziness, pattern, and visual interest. Matching floor and table lamps provide artificial light. Hanging plants bring freshness and visual interest. Definitely an inviting space! 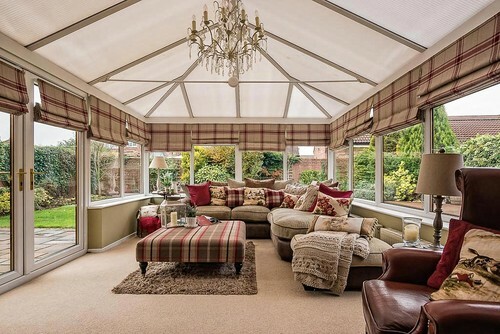 Whether called conservatories, green rooms, or garden rooms, sunrooms are spaces that offer comfort all year round. Unquestionably, they can add some extra living space to any home and make an awesome place where to entertain and relax with family and friends. Furthermore, sunrooms blur the line between indoor and out, bring nature indoors, improve lifestyle, and help create an organic vibe. If you don’t have a sunroom, unleash your creativity and transform any unused space into an inviting place, even a small patio or an attic can do the job. If tough on budget, work what you already have. After all, it is not that hard to create a piece of paradise!